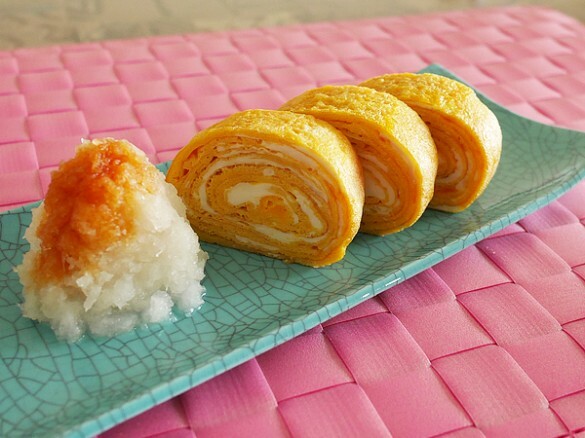 In any Japanese-style breakfast or bento lunchbox, you’re virtually guaranteed to find the stock-seasoned rolled omelet called dashimaki tamago. 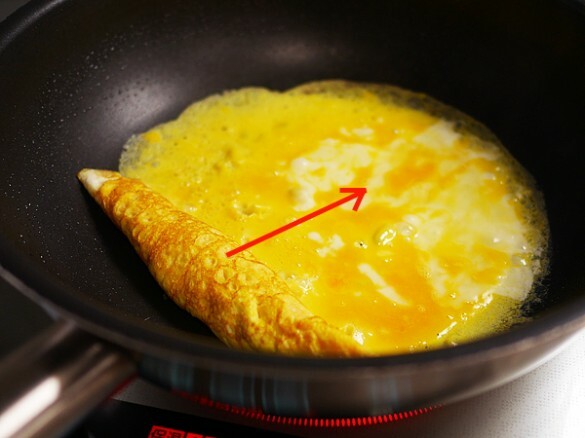 You can buy a special frying pan or tools to ensure that the omelet is the right shape, but it’s actually possible to make a good dashimaki tamago omelet in an ordinary frying pan. 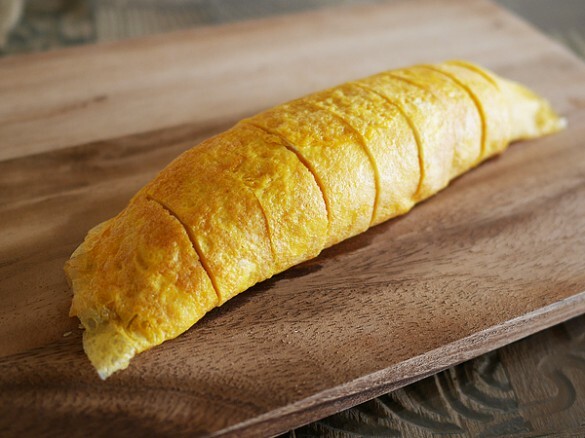 The ideal dashimaki tamago omelet is plump and juicy on the inside, and sweet and fragrant on the outside. I have three tips for making the kind of exquisite dashimaki tamago omelet worthy of a luxury ryokan inn. 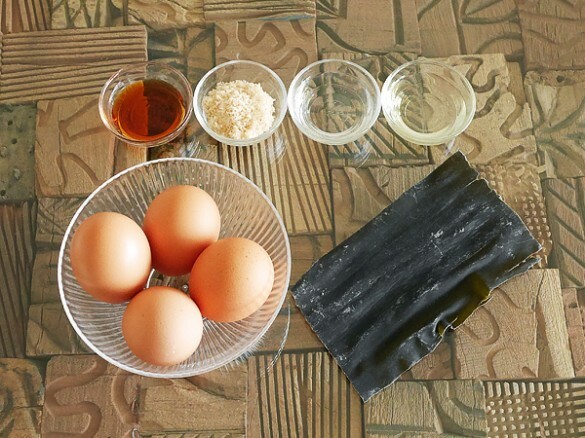 (1) Make a “super-konbu stock” that’s as rich as butter and as sweet-smelling as syrup The biggest secret to making tasty dashimaki tamago omelet is ensuring that the stock is delicious. When preparing the ingredients, sear the konbu in a toaster oven and use it to make a rich, sweet-smelling, golden stock. (2) Don’t beat the egg too much To make a fluffy omelet, it’s vital to ensure that the egg whites retain just enough elasticity. 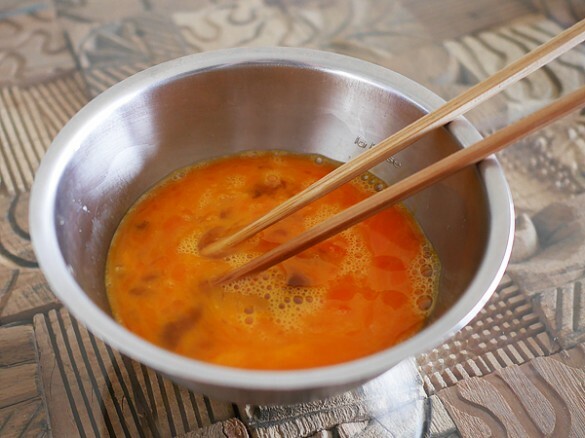 Taking care not to beat the white or the yolk too much, mix them with chopsticks using a scooping motion about five times. (3) Keep the heat on medium If you use a low heat, the protein in the eggs will harden and the omelet will lose its plumpness. Conversely, the omelet will burn easily if you cook it on a high heat, so you’ll get the best results if you cook it on a medium heat. 1. 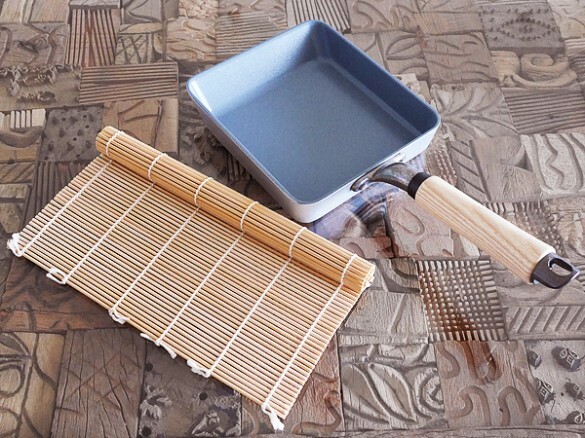 Soak the dried konbu in saké and heat in a toaster oven on the Warm setting (around 300W) for 5 minutes on each side. 2. Place the sweet, fragrant konbu in a heat-resistant container, then pour 1L of hot water over it and leave it to steep for at least 30 minutes. If you make a large batch and keep it in the refrigerator (it will last for 2 days), you can also use this stock in soups and simmered dishes. 3. Crack the eggs and beat them lightly. Add 6 tablespoons of the super-konbu stock, the soy sauce, and the sugar, and lightly mix them together. 4. Pour the oil into a well-heated frying pan and use a paper towel to coat the surface of the pan thoroughly with the oil before pouring in a little of the egg mixture. Cook on a medium heat. Once the surface puffs up, roll the omelet up. 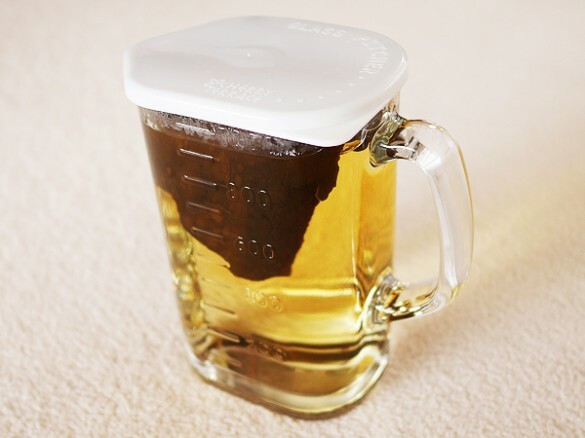 You can roll it from the bottom to the top, or from the top to the bottom, whichever is easier. 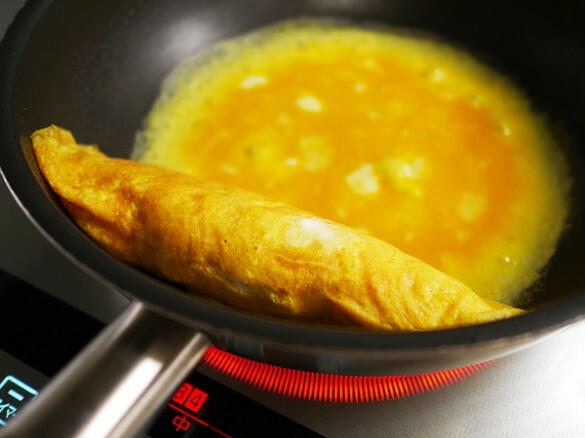 (The photograph shows the omelet rolled from the bottom to the top) 5. Return the rolled omelet to the starting position, pour in some more of the egg mixture, and cook and roll again in the same way. 6. 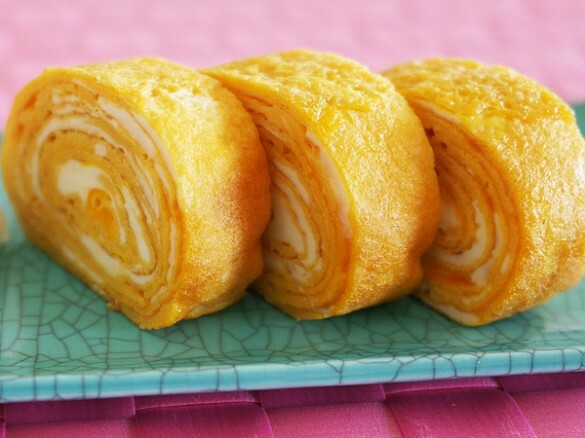 When all the mixture has been used and you’ve finished rolling, place the rolled omelet on a flat surface and allow to cool. 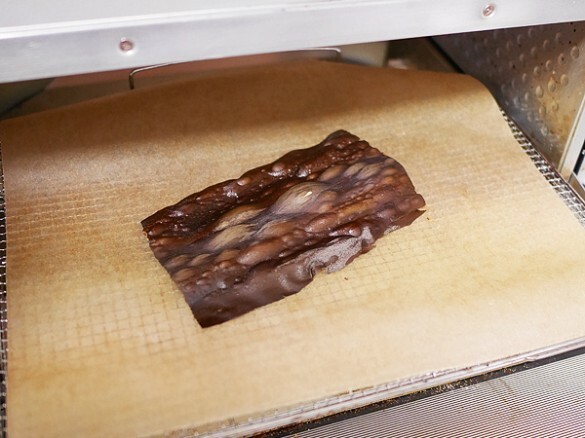 Once it has cooled enough to handle, cut it into slices. 7. Place on plates and it’s ready to eat. The classic serving method is to accompany it with grated daikon radish seasoned with a little soy sauce, but it’s also delicious when accompanied by tomatoes and other vegetables. By SUGI AKATSUKI see all recipes Profile:SUGI AKATSUKI Graduate of the University of Tokyo. Researches culinary culture and foods that promote longevity and beauty. Studied basic medical science and life science at university. After studying organic food and Kushi macrobiotics, she began to conduct culinary research independently. Her motto is “simple ways to stay beautiful.” Her specialty is healthy dishes ideal for the busy woman of today. She also teaches yoga and has a popular blog（http://saqai.com/）.